If you don’t want your boat to look like a Salty Dog, then you’ve got to be able to take care of it properly. When a boat is left out in the sun, the materials will naturally expand and contract as it is heated and cooled. The sun will naturally fade the appearance of the boat and even yellow it somewhat. Then there’s the wind, the rain, and the general muck of the outdoors. 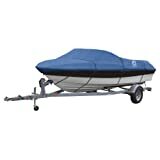 To prevent of all this issues proactively, you need one of the best boat covers that is manufactured today. For a somewhat modest investment, your new boat cover will prevent fading and oxidation. It will hide items from theft. To get the best boat cover, the chart below will help you quickly compare and contrast the most usable items on the market today. What Are the Boat Cover Basics To Know? Many boat owners see a cover as a security tool. In other words, what is out of sight will be out of mind. An added benefit is that you won’t have to clean up as much mold on the outside of your boat either. Your first decision is to look for a storage cover for your boat or to invest into a trailering boat cover. Trailer boat covers need to fit snugly. Storage covers can essentially be a carport, if you have one that is big enough. There are many universal fit boat covers that will get the job done effectively for you and for a pretty good price as well. These universal covers can provide storage and trailer covering options simultaneously, with some of the best boat covers in this field having a travel rating of up to 70 miles per hour. Custom covers, however, will always fit better on a boat than a universal cover will. The type of fabric or material that you choose for your boat cover will really help your boat stay nice over time. You need to have something that will be able to keep all of the rain out when you store your boat in winter, yet still let any moisture that has gotten under the cover to escape. They need to resist UV rays just as much as they can resist mold and mildew. That’s why many boat owners are looking at covers, which are made from a synthetic, coated fabric like marine canvas. Something as simple as a tarp, however, or even a cotton covering is better than nothing. Having an acrylic coated polyester is a good choice of cover for those who own a boat that is primarily made for wood. Urethane coating is a great option to consider if you happen to live in a climate that is regularly humid and hot. Expect a decent boat cover to run about $80 on Amazon right now for a 19-foot boat. Prices may vary, however, based on materials and the size of boat that needs to be covered. Custom boat cover prices are based on need. Made from a heavy-duty waterproof fabric, this universal boat cover works well for mooring, storage, and trailering. Unlike other boat covers, owners will find that this one has an elastic band in addition to the standard straps so that a tighter fit can be achieved. Often rated as one of the best strap systems that are available right now, it will work on any boat that has a maximum beam of 96 inches. With a 5-year warranty for the 600-denier solution dyed polyester, this is definitely an investment that boat owners won’t mind making. The reason why this boat cover is so durable is that it has been made with marine canvas instead of some polyester blend. The strap design is quite useful with this boat cover as well thanks to the quick release buckles. There’s an elastic cord available to help secure the bottom hem as well. This cover is more for traveling or for storing a boat over the long-term more than short-term moorage. Be sure to check out the two rear vents that have stiffeners built into them so that wind pressure can be effectively reduced. If you’re trying to cover a pontoon boat, it can be sometimes difficult to find a universal boat cover that works. Thanks to Vortex, however, that has become a very real possibility. Not only is this cover made from a waterproof polyester material that can stand up to the might of the sun, but it also affixes tight enough to the pontoon so that it can protect the boat during traveling. It’s perfectly designed to make sure that water stays out, but it won’t keep moisture in either. One of the best boat covers on the market today is also one of the most affordable. It’s the integrated system of buckling and strapping that really help to make this cover stand out from the rest of the pack. The straps are adjustable and they snap into the buckles much like you’d find on a car seat. There’s enough room in this boat cover for additional accessories as well, like your running lights, thanks to the full cut design. Made from tough polyester, dirt and stains don’t stand a chance when this cover is on your boat. Sometimes it isn’t a full boat that needs to be covered. Owners of canoes and kayaks want to protect their investment as well and that’s what this boat cover does. With a heavy-duty zipper, you’ll actually insert your kayak into this boat cover so that it’s like having a giant polyester bag. You then just attach the canoe or kayak to your transportation method and you’re ready to have some fun water recreation. It’s simple, affordable, and effective. The best boat cover doesn’t have to be a complicated item or a customized fit to provide your boat with protection. Use these tips and options today to select the right cover to meet your needs and your boat will thank you for it.